A NEW air ‘Ambucopter’, with better medical facilities and extra space for providing life-saving medical treatment after accidents and other serious incidents, has been acquired by the Lincolnshire and Nottinghamshire Air Ambulance Charitable Trust. The Ambucopter, an AgustaWestland 169 (AW169), supplied through Specialist Aviation Services, Cheltenham, has been acquired by the charity with legal support from North East and Yorkshire law firm, Newtons Solicitors. The AW169, which will be based at RAF Waddington, where the charity has had its operational base since 1994, will replace an MD902 Explorer. The AW169 has a much larger cabin giving the medical team 360-degree access to the patient, allowing life-saving, time-critical interventions inside the aircraft, which isn’t possible with the current Ambucopter. As it can travel at speeds up to 185mph, the AW169 is also capable of flying faster than the MD902 Explorer, which could prove crucial in arriving at an incident and airlifting accident victims to hospital. Legal support for the latest Ambucopter was provided by head of the company commercial department at Newtons Solicitors, James Towler who first acted for the charity in 2000 when it leased its first MD Explorer, and again when it replaced it with the latest model in 2010. The Lincolnshire & Nottinghamshire Air Ambulance, which needs £2.1m a year to maintain its service, works closely with East Midlands Ambulance Service in organising the Ambucopter to fly to emergencies throughout Lincolnshire and Nottinghamshire. The aircraft covers more than 3,000 square miles and can reach an accident, or a medical emergency, anywhere within the two counties in less than 20 minutes. Since the charity was founded, it has been called upon more than 17,000 times. The Ambucopter’s doctors and paramedics bring the equivalent of an A&E department to an incident and can transport a patient to a specialist unit or major hospital in a fraction of the time taken by road ambulance. 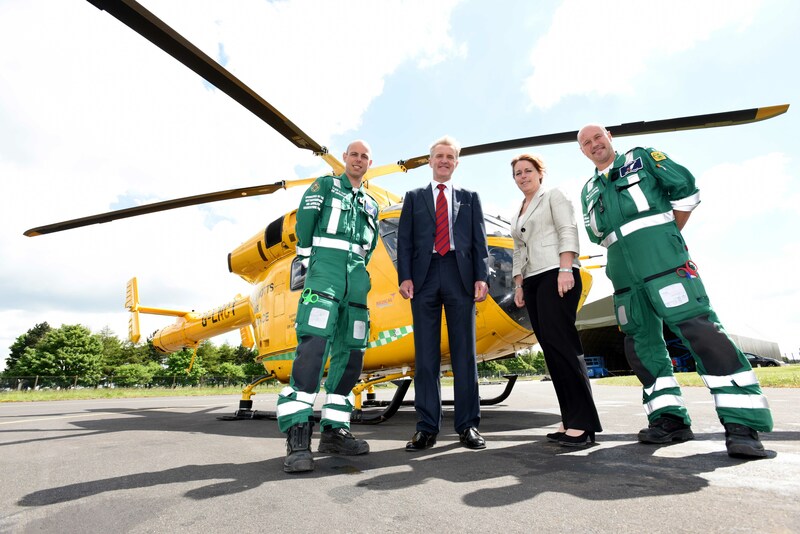 Lincolnshire & Nottinghamshire Air Ambulance chief executive, Karen Jobling, said: “The new AW169 Ambucopter is an exciting development for us and the community we serve and we’re grateful for the work undertaken by Newtons Solicitors in assisting us with the contract. “Our life-saving work would not be possible if it wasn’t for the excellent support we have from the local community. Fundraising is our life-blood. We receive no direct government funding but rely on the support of the community to raise the funds we need to keep our Ambucopter flying.